Do you have your gift giving list made yet? All the gifts purchased? If you are like most people, maybe you haven’t even giving it much thought. And yet, every where we go we see the Christmas Countdown signs – December 25th will be here sooner than later! 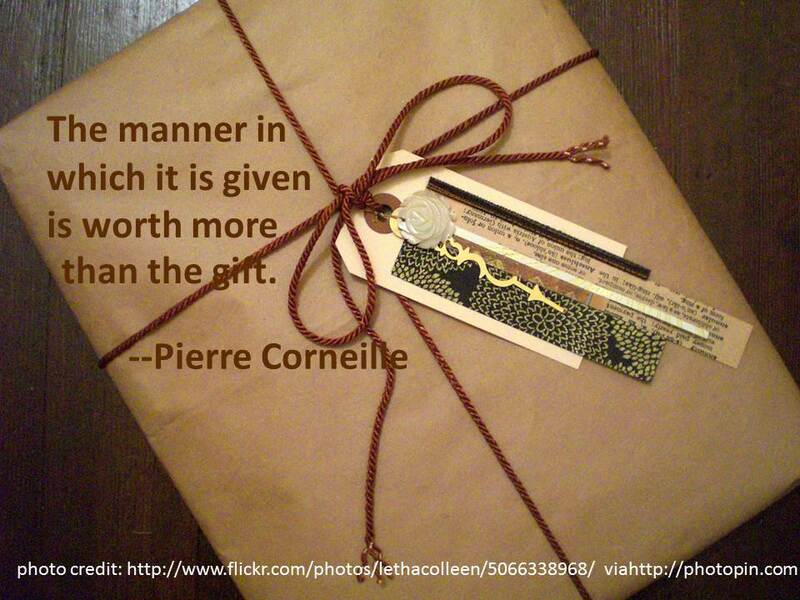 One of the things most people struggle with is how to give a gift to every person in large groups of people. Groups include but are not limited to teachers, co-workers, office staff, Bible study group, Moms Group, Mens Group, etc. This is a well-received gift, particularly for teachers. Choose a local charity and make one donation in honor of the teachers. Then, put a small pre-printed insert in the card along with information about the charity and have your children personally sign it. Its best if you choose a local charity or take a look at the list here. PLEASE be sure to due your due diligence with the charity you choose. We started this tradition in our family several years ago. Each adult who wants to participate in the exchange purchases a small gift, usually no more than a certain dollar amount. Then, there is a gift exchange game ( there are several variations ) where people choose a number and then choose a gift. Some years, we have done a certain theme, like all the gifts have to do with something for the kitchen or something for the car. Many local Churches and family-oriented charities NEED people to sponsor a meal or presents for families. Maybe you or your group could all pitch in and sponsor the meal or the gifts for a family. I know our Church collects presents for families and some Churches have “Giving Trees” where you choose a tag off the tree and sponsor one child. This is also a great gift-giving idea – sponsor a family or child in honor of someone as their gift. I forget where I heard this story, but someone recently shared with me how everyone in their family donates $20 each paycheck all year to a Vacation Fund and then the family goes on a trip each Holiday Season. Starting a fund for a certain person (i.e. activities fund for kids) or group of people (i.e. family vacation during the summer) is a great way to give a memorable gift! What are YOUR gift giving tips for reducing stress this holiday season? I’d love to read them AND maybe even feature them in an upcoming post! Are you going to try any of these tips this year? I’d love to know what you did!